"Birth of Athena" 8 x 4 in. 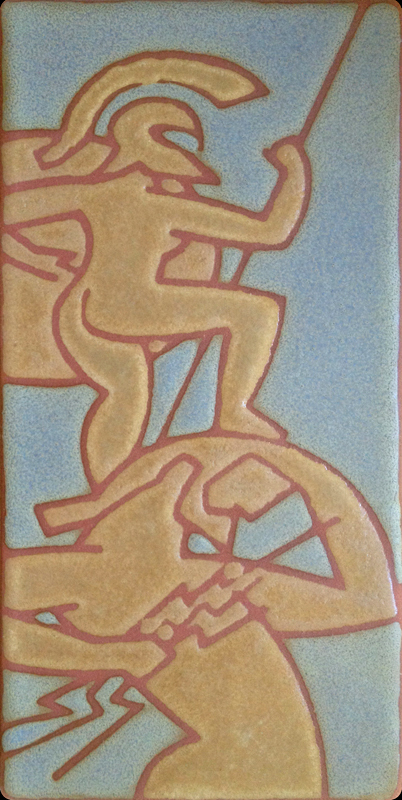 A couple times this summer I have taken tile workshops with Vashon Island artist Cory Winn. She makes truly exquisite and intricately patterned pottery, objects, tiles and tile installations. Influenced by early English arts and crafts and medieval illustrations, Cory's work is meticulously crafted and then glazed using the cuerda seca technique. Cuerda seca, (Spanish for "dry cord") is essentially a wax resist line painted to separate the water-soluble glazes. It is an ancient technique that can make crisp patterns and multiple colors on fired terracotta sing! Cory is a great teacher and I am quite taken with the whole process. You know you are having fun when minutes turn to hours and an afternoon has flown! My tile at left celebrates the cerebral birth of Athena, Goddess of wisdom, daughter of Zeus and the Titan Metis. When Zeus heard the prophecy that a child Metis bore would usurp his thrown, Zeus tricked Metis into turning herself into a fly and promptly swallowed her. She was however already pregnant with Athena and nine months later Zeus experienced the mother of all head aches. When he could no longer stand the pain, Prometheus (or Hephaistos, according to some) struck the head of Zeus with an axe, and from his crown Athena sprang, clad in armor and already the embodiment of heroic endeavor.